With all of the activities that Southland has to offer, you'll never run out of things to do! Activities include the Gator Glide, Human Foosball, Bayou Beans Coffee Shop, General Store, Rockwall, Sand Volleyball, Outdoor Courts, Rifle Range, Paintball Trail, Frisbee Golf, Crafts, and much more! See our facilities here. What to Bring: Bible, notebook, pen, toiletries, casual clothes, sports clothes for activities, swim suit (girls-modest one piece; boys-swimming trunks), shoes for informal services and recreation, old clothes and shoes for water activities, spending money, bedding, pillow, towels and washcloth for those staying in cabins. All bedding and towels are provided for sponsors staying in the Fellowship Inn or Stokes Lodge. If desired, you may also bring a camera, fishing pole, and baseball glove. Do not bring: Alcoholic beverages, non-prescription drugs, tobacco, fireworks, firearms, MP3 players, radios, tape players, CD players, walkie-talkies, TV’s, video games, computers, cellular tele-phones, pagers, magazines, short shorts or short skirts, tight slack or tight jeans, T-shirts with worldly advertising. Campers cannot keep food in the cabins. Pets are not allowed on the campsite. Emergencies: In case of emergency, call the office at (318)894-9154. Under normal circumstances, campers should not be called or visited. Telephones are not available for camper use, except in case of emergency. 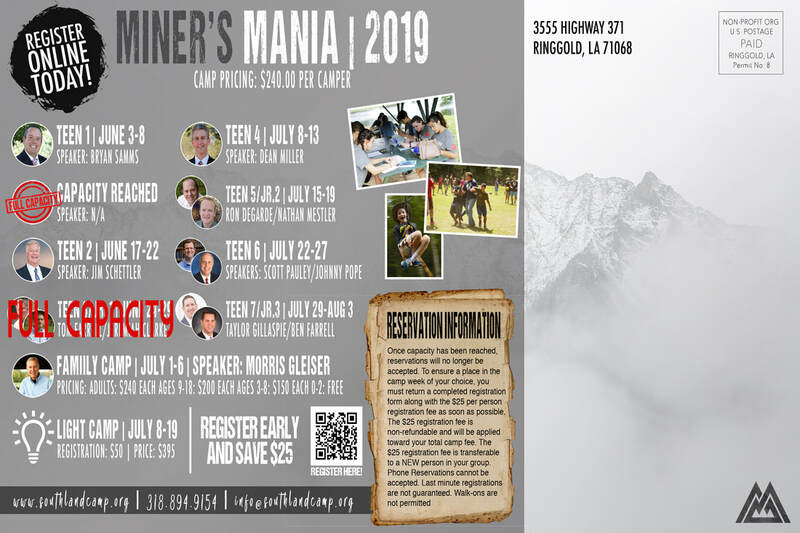 Extra Camp Costs: Snack shop, General Store, Craft Shop, Coffee Shop, rifle range, paintball, preaching CD’s, cabin/camp picture, camp T-shirts, special projects, speaker offering. 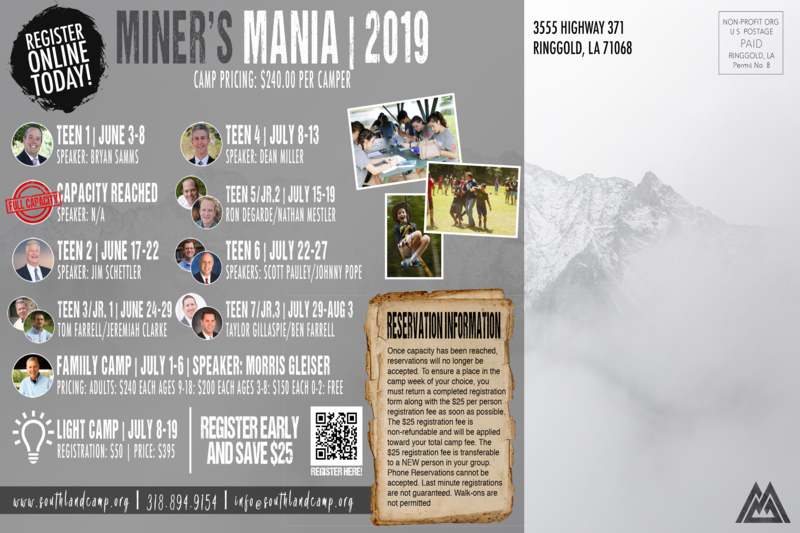 Please call the camp office for information and pricing. Sponsors: Prices listed for a camp week apply to both campers and sponsors. For every ten campers, one sponsor may come for half price. Sponsor numbers may be limited by the size of the camper group, or by the amount of sponsor housing available. Newborns are permitted and we do have a limited amount of space for sponsor children ages 2-5 for an added cost of $145 per child. The early bird discount does not apply for sponsor children.